PARIS — The United States may have withdrawn from the Paris climate change accord, but on Tuesday dozens of world leaders and philanthropists met to find solutions to the swiftly warming planet — and send a message of resolve to the White House. More symbolic than policy-driven, Tuesday’s summit comes two years after the landmark ‘‘COP21’’ conference in Paris, where 196 participating countries — including the United States — vowed to keep this century’s global temperature increase below 3.6 degrees Fahrenheit. In one of the most controversial moments of his young presidency, President Trump announced in June that the United States would leave the Paris accord. 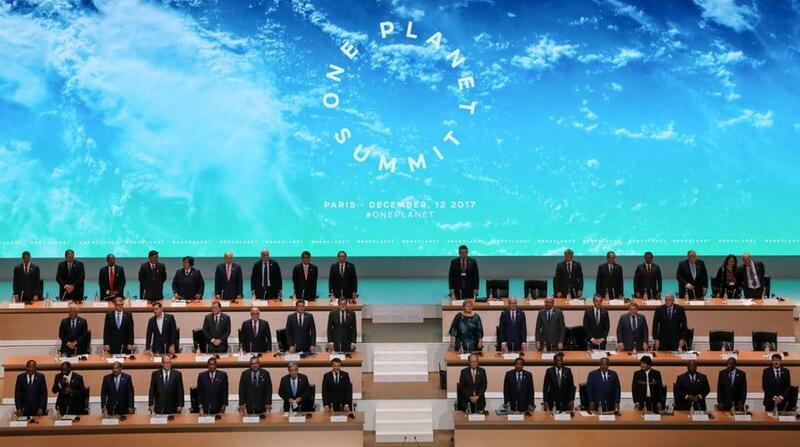 The One Planet Summit focused on practical ways to continue meeting climate goals without the participation of the US government. The main emphasis was private financing for climate initiatives in the United States and elsewhere. A major goal of the summit was to encourage private investors to fill the annual gap of $210 billion needed to meet the requirements of the Paris agreement. Toward that end, the summit did secure some major commitments. The Gates Foundation, for instance, said Tuesday that it would pledge $300 million over the next three years to support farmers in Africa and Asia struggling with the effects of climate change: diminished soil fertility, extreme weather, and crop pests, among others. Earlier this year, the foundation had pledged a separate $300 million to benefit public health and poverty reduction programs in Tanzania. AXA, the world’s third-largest insurance company, announced further reductions of coal investments by an additional $2.8 billion. And the World Bank — to meet its Paris commitments faster — said it would stop financing projects involving upstream oil and gas beginning in 2019. Other US philanthropic organizations also supported the cause. On Monday, the Hewlett Foundation pledged $600 million over five years to nonprofits working on climate change issues. On the US front, former New York City mayor Michael Bloomberg, a billionaire and leading climate change advocate, vowed to persuade more companies to change their practices. Bloomberg emphasized the business incentives behind addressing climate change. ‘‘Clean energy is now cheaper than coal, energy efficiency saves money and improves your bottom line, and talented people want to work for companies that care about the planet,’’ he said. The biggest challenge to persuading more companies to go green, Bloomberg added, is that ‘‘reliable data doesn’t exist.’’ To solve that problem, he has chaired the Task Force on Climate-related Financial Disclosures, an organization that seeks to communicate financial risk related to climate change. Since his election, climate change has been among Macron’s signature issues. When Trump said the United States would drop out of the Paris accord, Macron immediately launched a campaign called ‘‘Make Our Planet Great Again,’’ a riff on Trump’s campaign slogan. As part of that campaign, Macron offered research grants for 18 foreign scientists studying climate change to pursue their work in France. On Monday, he revealed the winners, including 13 Americans. For political analysts, Tuesday’s summit provided further evidence of Macron’s desire to assert France as a principal mediator in virtually every important global deliberation, especially on climate change. ‘‘There is an element of prestige here, because France and President Macron want to play a leading role in the global climate governance, and I think there are just two leaders who are credible there: Macron and [Chinese President] Xi Jinping,’’ said Marc Antoine Eyl-Mazzega, director of the Center for Energy at the French Institute for International Relations, a Paris think tank. Xi — who was not in attendance at Macron’s second Paris summit, although Chinese representatives were — also has been a supporter of the Paris agreement, even if China remains the largest emitter of greenhouse gases on Earth. ‘‘Some countries have become more inward-looking and less willing to take part in international cooperation, and the spillovers of their policy adjustments are deepening,’’ Xi said in September, stopping short of mentioning the United States by name. But some see Chinese emissions as the potential thorn in Macron’s plans. ‘‘The exit of the US from climate credibility leaves a gap. The US has traditionally played the role of bad cop with China, forcing them to reduce their emissions. Now that role may fall to Macron,’’ said Paul Bledsoe, a former Clinton White House climate adviser, now with the Progressive Policy Institute.